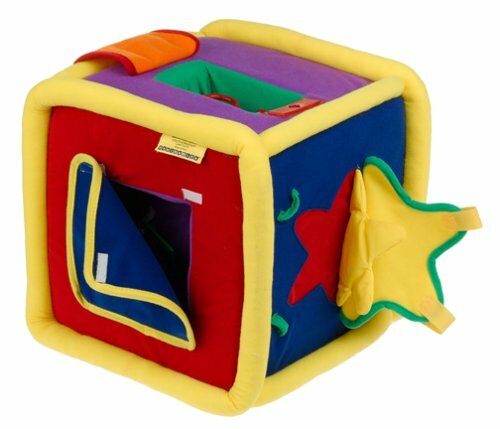 Working on motor skills and learning through songs and colors, the Neurosmith Jumbo Block is fit for kids ages two and up. This Jumbo Music Block by Neurosmith has six sides with all different colors and shapes, and each time a child turns the block, a different song plays. There are a variety of musical styles available from around the world. With six sides, six different shapes, and flaps to open to the inside, there are many ways a child can learn with Neurosmith’s Jumbo Music Block. Every time the child turns the block to a new side, a song relating to that shape will begin to play. The child can then open the flap on the specific side and see inside the block to learn more. They also are introduced to their colors, as each side of the block has a different color theme. A fairly new learning toy for children, Neurosmith’s Jumbo Music Block helps kids learn their shapes and colors through song. Not only does it teach, but it works on children’s motor skills as well. It is a soft toy that has six sides, each with a different shape. Each of these sides can open up and the child can see little colored patches on the inside. Users say that although it is very soft, it is extremely durable. Some say that they’ve had it for years and passed it down to each of their children. After several years, there is no visible sign of wear and tear. The songs are educational, singing about each shape on each side. For kids, users say there are a lot of things to play with- there’s the songs, the little patches inside, and for young kids, they can even use it as a little stepstool or push it around to help them with balance. Unlike the newest model of the Neurosmith set of five music blocks, the sound quality from the Jumbo Block is said to be phenomenal. It’s clear and allows children to actually understand what they are hearing. Some parents have said that after a while, the jingles get annoying, and sometimes it can be hard to hold the child’s attention. The Jumbo block is a soft block covered in cloth. No concerns have been reported with this toy. There is no risk of choking. Catchy sing-along songs teach toddlers all about shapes as they explore the many surprise features and textures of this giant block of fun. 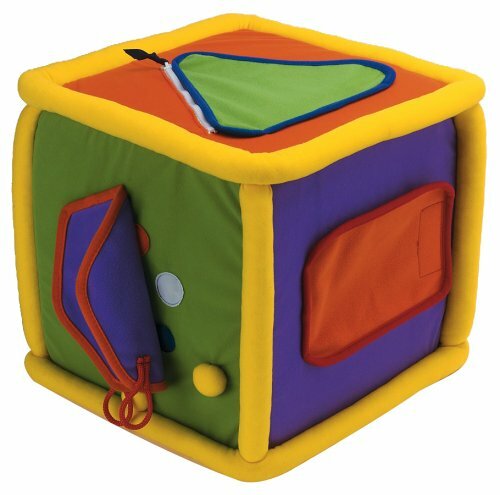 Plush block has 6 different geometric-shaped flaps that hide secret pockets, surprise activities and various zippers, buttons and snaps. It includes 6 upbeat tunes and peek-a-boo mirror. Teaches shapes, colors and dress-me skill seven helps baby to stand up. It is also compatible with 3-in-1 cartridges.